The dress doesn’t need to be red, but you know it will feature the color somehow. Perhaps red with an orange flare. It will remind you of fire, no doubt, but then you’ll hear the clack of the shoe as she stomps the ground, raises up her hands, snaps her fingers a few times, and then the music is going to transform and that mildly raised brow and polite applause will transform into pure excitement. Because, when it comes to the dances that make your heart start pounding, there is nothing greater than the flamenco! 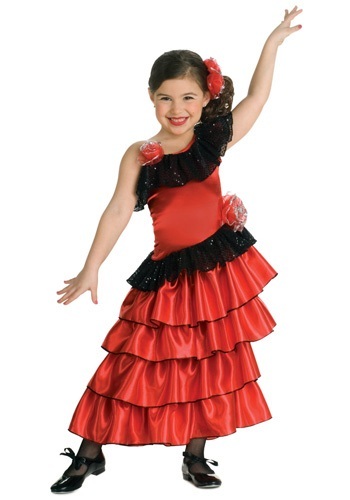 Share the musical mastery with your youngster, too, with this Spanish Flamenco Dancer costume. This exciting red dress features a beautifully layered skirt with black accents and lace ruffle. Twin red flowers accentuate the waist and shoulder while the matching headpiece fits with a black comb and shows off another brilliant rose. Accessorize with some tap style shoes or some zambra castanets to clack her way to winning the competition. Better yet, pair your little flamenco dancer with another and take home the trophy.